In fragrance, flavor and beauty technology, the ability to control the delivery and release of a taste, smell or active ingredient has become increasingly important in the effort to appeal to consumers and boost brand differentiation. Many of the leading fragrance and flavor houses are working to push back the boundaries in perhaps one or two of these fields. But those investing in all three, particularly in the area of micro encapsulation and the entrapment of molecules in visual ingredients that are visible to the consumer, are opening up the possibility for new synergies that will lead to the next generation of fragrance, flavor and beauty delivery platforms. This has justified increased investment by CPG companies in fragrances, first in laundry care, expanding gradually from the fabric softener and powder detergents into liquid detergents including unit doses. Following this, deodorants were the first personal care products to incorporate encapsulated fragrances to achieve long-lasting protection and moisture triggered release. The first shampoos, conditioners and body washes containing capsules are now successfully penetrating the wider personal care market. The release of fragrance in capsules are released either by gentle friction, temperature, humidity, ionic strength or light. In any product the free, un-encapsulated perfume is the ‘hero of the piece’. The free oil creates the immediate sense impression on the consumer, either when handling wet laundry from the machine, or when using shampoo in the shower.2 But in order to achieve a long-lasting impression of freshness, and more specifically the right intensity and hedonic at each stage, the encapsulated perfume is released later in the use cycle. The release is triggered either by gentle friction, temperature, humidity, ionic strength or pH (light). The capsules can be designed to break down at any one of a number of different stages in the use cycle, when washing is dried, ironed and folded and later on when it is removed from the cupboard. The effect is to create an overall, long-lasting impression of clean and fresh laundry. Capsules carried in shampoo, which are deposited on skin and hair, will similarly release additional sense impressions long after drying. 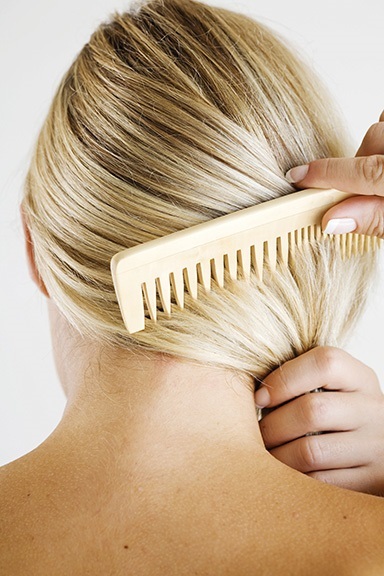 Touching the hair or brushing it against the pillow at night will cause them to release more fragrance. Meanwhile, the citrus top notes in deodorant, which are crucial for creating the impression of 24-hour protection, would not survive without encapsulation. Perhaps one of the more difficult challenges is that faced by the perfumer. He or she must create an accord that has impact in small doses and does not react with the wall of the capsule to alter its physical-chemical balance. Capsules make up a very small percentage of the volume of the final product. While they might have a high payload, perhaps up to 90 percent of their weight, not all of them will be successfully deposited on the target substrate; neither will they all break open at once. So when release does occur, there is precious little perfume available, which means the accord must have a strong smell. However, many of the ingredients available to the perfumer can interfere with the interfacial polymerization process of the capsule. Also, if the perfume ingredients have too much affinity for the shell once formed, a plasticizing weakening effect may occur and cause leakage into the product base leading to substantial loss of performance. This means the palette available to the perfumer is very limited; out of over a thousand ingredients, perhaps only 300 might be suitable for encapsulation. Therefore a special collaborative effort is required between the perfumer and the chemist to design each product to avoid destabilization of the capsule and leakage. However, some ingredients that would be pungent and unpleasant in a free oil, can be used to provide a boost of freshness on wet and dry fabric at the applied capsule dosages. Development and innovation in the flavor industry is driven by consumer demand for fresh and differentiating experiences in taste and release. This compels customers to look for flavors and flavor profiles that are authentic and as close as possible to that of freshly prepared food. This has created a significant opportunity to develop and apply innovative encapsulation technologies in the flavor sector. Today, these systems are viewed as a key enabler for future innovation in this area. The delivery system is the essential bridge between the flavors themselves, which are usually complex blends of substances with very different chemical and physical properties, and the beverage and final foods, which are often aqueous environments. One cannot be directly blended into the other, so something else has to happen to unlock the full potential of the flavor. Traditional approaches include turning the flavor into a suitable physical format such as an instantly soluble powder, typically produced via a spray drying process,7 or emulsion8 that can be easily dissolved or suspended in the food. The encapsulation technology creates a physical barrier around a flavor and prevents it from reacting with the environment and losing its original profile. Furthermore, just as is possible with fragrance, encapsulation allows the controlled release of flavor in response to certain triggers. For example, granulation techniques can be used to create multiple-coated particles,9 in which flavor-enrobing matrices dissolve slowly to give a slow release of flavor, for example in chewing gum or in the cooking process. The ability to make technological advances, however, will depend on skill and innovation in three key areas. First, in the selection of materials, where there is a growing need to replace chemically modified ingredients with natural substances and those that are more label-friendly. Second, the industry must develop a foundational understanding of how these materials behave in flavor applications; and finally, it must also improve the efficiency and sustainability of processing technologies. When it comes to the material basis of delivery systems, customers are always keen to make more appealing declarations on the end product labels. As an example, modified starches have historically been used as encapsulation matrices in spray drying thanks to the solubility in water and the ability to form a robust encapsulating matrix around the flavor. The challenge is now to either develop natural starch-based materials, which can provide the same performance, or research alternative materials from different sources. A scientific approach to the understanding of how materials behave is also essential. While much is already known, there is work to be done to close the gaps in the existing knowledge,10 for example to pinpoint how specific flavors might be best protected in an encapsulation matrix. There is also room to improve the cost effectiveness and sustainability of processing technologies, such as using less water and working at lower temperatures in the drying processes, which would save energy and reduce the CO2 footprint. All of this work depends on the company’s ability to grow cross-functional teams within the organization. In the past, flavor divisions typically relied on expertise in food science and chemistry. Today, there is a move to further drive innovation by drawing on knowledge and practice from the biosciences. Biological systems are seen as a rich source of inspiration for the development of new delivery systems, for example in the use of natural ingredients and creating more sustainable processes. Biological processes found in Gum Arabic provide innovative methods for functionality in flavor encapsulation. 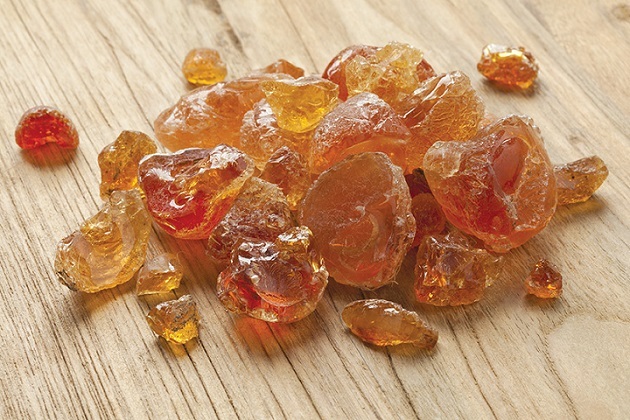 An example is Arabic Gum, a natural ingredient collected from the acacia tree. When harvested, a wound is made in the tree and the exudate flows out to seal it, forming a natural film to protect the plant. This functionality is used in flavor encapsulation; the gum creates a film around the flavor, a dry powder, to protect it from fading away. Natural systems are seen as essential to the future development of flavor technologies. By investing in a culture of innovation, a company can build the capability to develop new ideas quickly and respond to customer needs. But there is also much to be gained by looking further afield and building strong partner networks with other leaders and innovators in academia and industry. The vibrant and rapidly expanding start-up sector is also a rich source of innovators with new ideas seeking access to the market. Encapsulation offers potential for novel products and delivery systems in the active beauty market, where there is also a drive to use the technology to engage the visual senses of the consumer and open up new opportunities for marketing. Instead of microscopic capsules, the strategy is to employ ecofriendly visual ingredients that are visible when suspended in a shampoo, a shower gel formula or in a white emulsion. The visual ingredients are made of cellulose and sugar and they disintegrate and disappear when the finished product is used. The active ingredients are incorporated in the cellulose matrix and the sugar enables this to harden upon drying. The eco-friendly visual cues can be manufactured in a range of three-dimensional shapes such as beads, hearts, stars or flowers. These attractive visual features open up a new channel for direct communication with the consumer. Once added to the formula, the shapes become soft in a matter of few hours or days. The technology is a successful means of improving the visual appeal of certain products, but it also has the potential to be used as a delivery system and at the same time visually communicate the presence of an ingredient in the formula. A key feature of the visible sphere technology is the lack of a hermetic shell or outer layer. Rather than encapsulate, the spheres entrap the active ingredient or molecule. The same system can be used in cosmetics and personal care products to entrap pigments. For example, it would be possible to make a transparent formula that changes color as the spheres break down on application to the skin, such as a soap for children that produces blue foam. For this purpose, 40 per cent of the pigment is entrapped in the cellulose core; then the shapes are coated with another color to disguise the pigmented center. The technique of coating spheres with a color that is different to the one they deliver can also be applied in makeup products, to boost their consumer appeal. For example, a brown-pigmented sphere with a white external layer would completely disappear in a white emulsion. On application the formula would become a foundation. By combining the technology in flavor and fragrance delivery with visually attractive eco-friendly visual cues, consumers can experience an enhanced smell and taste experience in their products. In the case of fragrance, researchers are looking at the possibility of creating a capsule that carries both a fragrance and an active ingredient, which would deliver long-term sense impressions, as well as, active molecules into the skin. It takes years to develop and master these technologies and then turn prototypes into marketable products that are compliant and safe. Usually companies in the field might specialize in one area of application such as fragrance or flavor, but very rarely do they have all three fields running in parallel. But when a company does have access to all three fields, it can build up a pyramid of expertise and through developing synergies create a real technological and market advantage. JJG van Soest, Encapsulation, Chapter 20 in Flavours and Fragrances: Springer Verlag (2007) p 440. E Moeglin, Mintel, Scent trends in personal care and household, Presentation at InCosmetics 2015. HA Jerri, M Jaquemond, C Hansen, L Ouali and P Erni, “Suction caps”: Designing anisotropic core/shell microcapsules with controlled membrane mechanics and substrate affinity, Adv Funct Mat 1-14 (2016), DOI: 10.1002/adfm.201601563. S Bône, C Vautrin, V Barbesan, S Truchon, I Harrison and C Geffroy, Microencapsulated fragrances in melamine formaldehyde resins, Chimia 65 (3) 177 (2011). C Ortiz, M Holmgren, Testing fragrance encapsulation in vitro and in vivo, Bioencapsulation Innovation Feb 8-10 (2016). US Patent application US2015/004422, Encapsulation of perfumes, C Geffroy, SS Schreiber, MJ Goodall, A Fadel, IM Harrison, US Patent application (Feb 12, 2015). A Gharsallaoui et al, Applications of spray-drying in microencapsulation of food ingredients: An overview, Food Research International 40 1107–1121 (2007). PS Given Jr, Encapsulation of Flavors in Emulsions for Beverages, Current Opinion in Colloid & Interface Science 14 43–47 (2009). Patent WO2005084458F, Campanile, F Witteveen, “Particulate Flavouring Composition” (2005). EK Sahni, M Thakur, MA Chaney, et al, Food Biophysics 11: 20 (2016). doi:10.1007/s11483-015-9405-4.